is bringing it’s unique, cutting-edge MusicFirst classes into your school and community! This affordable, researched-based program is fined tuned to promote the healthy development of a child’s neurological connections, gross and fine motor skills, early language, socialization, and emotional development. Stage 1 (Age 0-1): This infant/parent class will use sensory stimulation such as bounces, tapping and clapping, wiggles and tickles, accompanied by simple songs, rhymes, and lullabies, to activate different areas of the developing brain of babies who are in receptive learning stage. These are in 6 week sessions that progress - $65/6 week session. Stage 2 (Age 1-2): This parent/toddler class will combined sensory stimulations with an emphasis on more advanced body awareness and movement such as finger plays, circle time and imitation, with the use of simple songs, rhymes, and rhythms of a more classical nature to nurture babies in their development of social interactions, speech and language, and gross and fine motor skills. These are in 6 week sessions that progress - $65/6 week session. Stage 3 (Age 3-4): This child-only class is for pre-school age children who want to explore and experience music on a deeper level through interactive songs, fun music games, and partner and group activities. Students will explore and develop and understanding of more complex rhythms, music notation, pitch exploration, and instrumentation using the fundamentals of classical music. 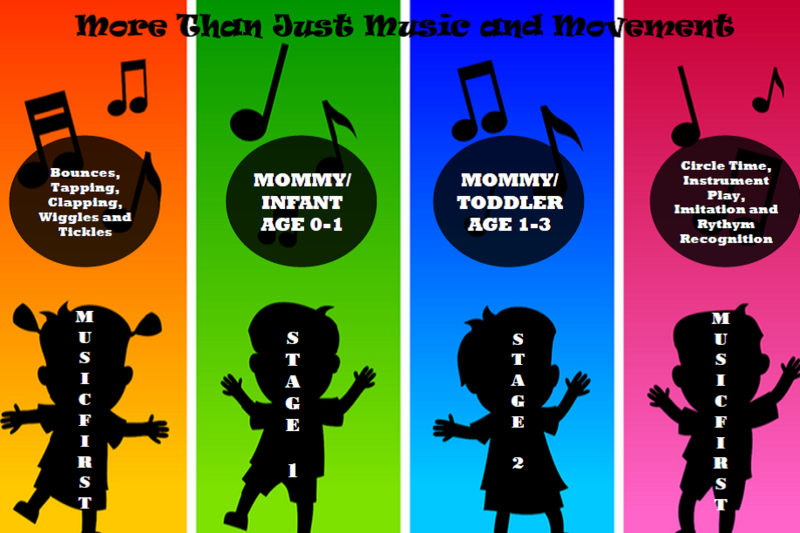 This stage of music instruction promotes the development of cognitive thought process, problem solving, situational and self awareness, as well as social, emotional, and physical growth and development. These are weekly classes that are $65/month. Classes are offered weekly at a price of just $65.00 per session or month depending on class. SINGLE classes are $15 each. 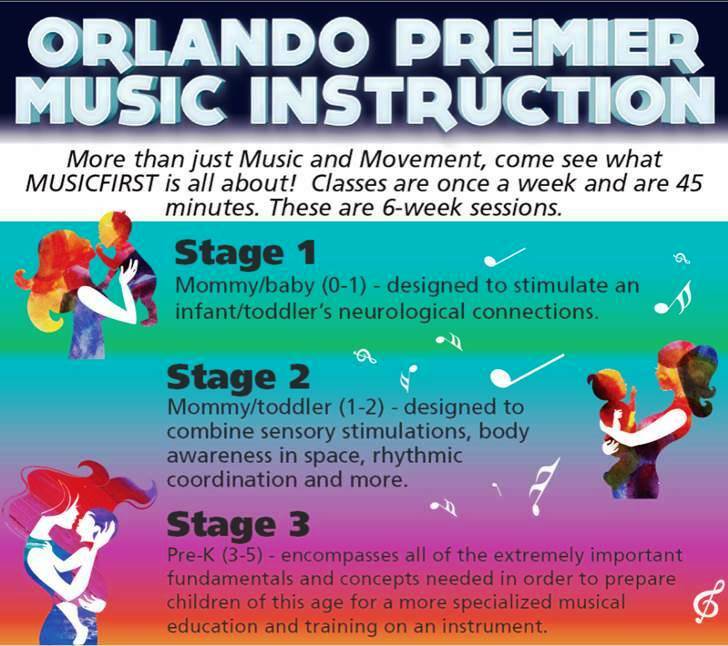 Click below for class schedule and registration for the MusicFirst program in your community!